Antique Art Deco TIFFIN Glass BLUE Dahlia VASE STERLING OVERLAY PARROT Fab Minty. NOTE: White spots from camera flash glare on reflective surface. A stunning, hard to find antique Art Deco Tiffin Glass Cupped Dahlia vase in blue having the fabulous Parrot sterling silver overlay by Rockwell Silver Co. A majestic parrot with a lot of detail worked in the silver perched and about to fly off of flowering branches. Rockwell was known for it's Art Deco overlay patterns and the excellent overlay quality. 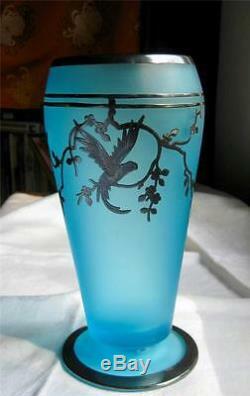 The Parrot silver overlay pattern combined with the gorgeous blue satin glass color make this vase a real stand out. The bottom has a hand painted # , possibly a date, "15 32 8". So if a date, August 15, 1932. 1932 would make sense for this vase if it is a date. That would mean this vase just had it's 85th bday. In beautiful, UNUSED, pre-owned condition. Found packed in original box. I have not washed it, or cleaned it in the least. The overlay has tarnish which I leave for the new owner to polish if desired. I did notice a small spot on the foot silver with slight discoloration, a very small spot, and it may polish right out with no issue at all. No chips, cracks, repairs or restoration, it's MINTY. 8" tall x 4-1/4" at widest, top opening approx. This blue color is gorgeous. Double boxed for safe travel. Priority or Parcel available, you can choose at checkout. I send out an invoice within 24 hrs. Or less, otherwise Priority and Parcel are options. Most of my items are old or vintage & will show appropriate signs of age & use. Linens and clothing have not been laundered unless stated so, they may have age related odors. I leave feedback once the sale is complete, that is once you have received your item and have left feedback letting me know. Please recycle or reuse your box & packing materials, thanks. Auctiva Offers Free Image Hosting and Editing. The item "Antique Art Deco Rockwell STERLING OVERLAY PARROT Tiffin BLUE Glass Dahlia VASE" is in sale since Thursday, November 30, 2017. This item is in the category "Pottery & Glass\Glass\Glassware\Elegant\Tiffin".